Some corporations are dangling their carrots or are they apples? 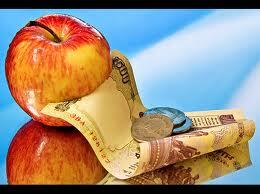 I have read & heard from employees-”If YOU want ME to lose weight- show me the money”.. Wow! Do you find a small problem with that statement? Does this mean corporations can count on sustainable changes from an employee, buy giving bonuses for the most weight loss, which by the way, is a temporary bribe. Does it make a difference of whether the weight was lost healthfully? Would this person eventually gain all the weight back, increasing risk for poor immunity and more doctor visits? You might as well be talking about games, when you say, “show me the money”. My thoughts are raising the stakes with weight loss, doesn’t work unless there is commitment to oneself to want to achieve true health with true weight loss. Without the right frame of mind to “be-healthy” or “mindful” of food choices, or toxic exposures, we might sometimes find ourselves stuck. A fast, do it now, forget about the consequences way of stinking thinking. Our comfort zone, may unconsciously keep us stuck, unable to step up or show up fully in our work environment. In health, there seems to be a wide margin of beliefs preventing us from moving forward. It could mean we think we have no way out from hereditary ailments. It could mean we are too overwhelmed to make permanent changes. What does it cost to be healthy? Are there cost differences in being sick or can preventing an illness be less expensive? A healthy weight can taste better, feel better, look better, smell better and always cost less than being sick and/or obese. Yet, how many dollars, hours and flowers are spent on sickness before we make that decision to change? Unfortunately being healthy is something we don’t even consider before taking that magic pill or playing those money games like “Show me the money”. Show me the money or show me health, are two very different steps, with very different directions and very different results. I teach corporate employees true health comes from within and they are happy to see my success rates and results. Connie is a Health & Wellness Coach, Published Author and Lifestyle Educator.